Maybe some folks should just avoid Halloween altogether. It’s almost Halloween which means there’s a lot of parties taking place both at home and at work. It also means there’s a lot of poor decisions on what would make for a good costume being made. For some folks the old standbys of vampires and werewolves and Freddy Krueger are just too passé these days. So they try to come up with something really unique. I bet he did Nazi that backlash coming. 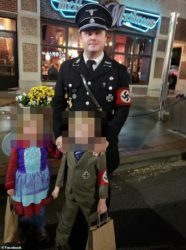 According to reports, the dad from Kentucky tried to justify his decision to dress his child up as the Nazi leader, and criticised those who ‘threatened’ him and his son at a local trick or treat event on Thursday. He wrote: “Tonight grown adults threatened a child over his costume. Threatened his mom and dad as well. Threatened to rip his outfit off of him screaming obscenities, scareing (sic) a small child. “Anyone who knows us knows that we love history, and often dress the part of historical figures,’ he wrote in a post that has since been deleted. “Tonight as we walked we saw people dressed as murderers, devils, serial killers, blood and gore of all sorts. Nobody batted an eye. But my little (son) and I, dress as historical figures, and it merits people not only making snide remarks, but approaching us and threatening my little 5-year-old boy,’ he wrote in the tone deaf posting. I also agree that if anyone did threaten his kid that that would be way out of line… but, dude! Seriously? You didn’t for a single moment stop and think that maaaaaybe this might be a bad idea? Here’s the thing you may not be getting here: There are still people alive who somehow managed to survive the Holocaust and, even though we’re talking about something that ended 73 years ago, it’s probably still a little soon to be an appropriate Halloween costume. You want to dress up as a historical figure responsible for untold slaughter? Try Genghis Khan. On second thought, that’s probably a bad idea too. Anyway, Nazi dad has since taken down his FB rant and apologized saying: “I think it was in bad taste for me to let my child to wear that, probably for me to wear that. It didn’t occur to me. I thought it was a bad decision on my part.” I could probably accept this as just some clueless dude who didn’t think his costume idea all the way through. That was until I saw the full content of his rant on Facebook which concluded with: ‘Yes, liberalism is alive and well. And we had the dis-pleasure of dealing with the fruits of the so called “Tolerant Left”‘. Now I’m not so sure it was as much cluelessness as it was someone upset they got called out for letting their Nazi freak flag fly. 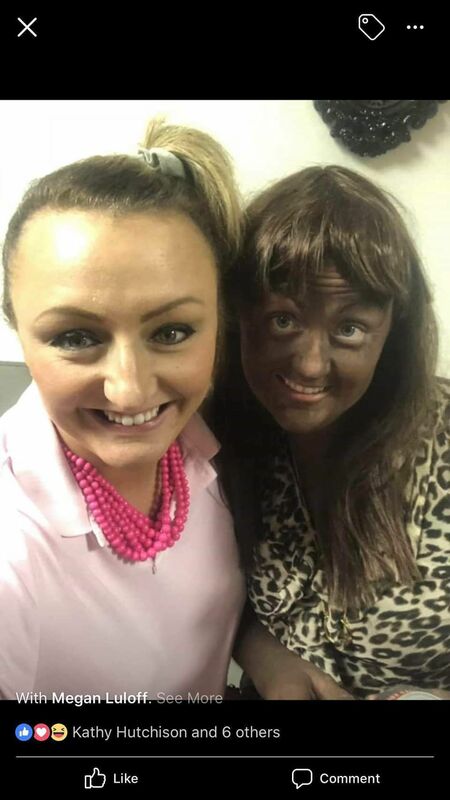 Art Tate, superintendent of the Davenport School District in Iowa, told the Quad-City Times in an email that Megan Luloff — a first-grade teacher at Walcott Elementary — is under investigation for showing up to a Halloween party on Friday with a face painted black as she tried to emulate Lafawnduh, a black character in the 2004 movie. Linda Hayes, vice president of the district’s school board, told the Quad-City Times that the decision to do blackface — and then have the photos shared online — is harmful for minority students. Oh no. No, no, yeah, that’s bad. That one’s going to leave a mark. Ms. Luloff didn’t not respond to a request for comment on her costume choice so, again, I’m willing to give her the benefit of the doubt. Maybe she just really loved the character of Lafawnduh. I’ve never seen Napoleon Dynamite so I have no idea what the character was like. It’s also possible she’s ignorant of the racist history of blackface. The school district wrote in a statement that it will make a decision about Luloff’s employment after the investigation is complete, according to The Root. “The district strives to provide a quality education enriched by our diverse community, in a fair and supportive environment for all,” the statement read. “The images run counter to the respect, values, and beliefs the district promotes and should not be a reflection on the District as a whole. I admire your bravery, Ms Luloff, if not your reasoning ability. The last person to pull off blackface in recent history was Robert Downey Jr. in the movie Tropic Thunder and it was a risky move that only worked because the film actually satirizes it. I get that everyone wants a unique and clever costume for Halloween, but you could save yourself a lot of trouble if you just stuck with the classics. At the very least, you should stop to ponder if there’s any chance your choice might offend a significant portion of your fellow humans either because it perpetuates racist caricatures or draws inspiration from one of the worst genocides in human history before committing to it. Just sayin’, but you do you. This entry was posted in Don't Be That Guy, Holidays and tagged Bad Ideas, Don't Be That Guy, Halloween Costumes by Les. Bookmark the permalink. I love people that self-identify. You can go ahead and assume their starting political opinions and take appropriate action. Kinda like those knuckleheads that put a lot of political stickers on their car. If it wasn’t for people like you Les i would give up on America , there must be millions of sensible , intelligent people like you over there, trouble is we ( in England ) only hear about the worst . Well thanks, Dave. I’d like to think I’m one of the better parts of my country, but I’m told I’m a narcissist so that probably goes without saying. 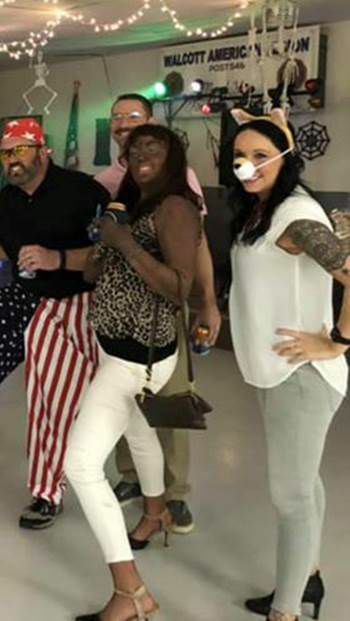 So now we have to add a nurse in Missouri who has been fired after deciding to dress up as Beyonce, complete with blackface. Los Angeles Times fires photographer who altered war picture. Dumbasses pay to sit in mines filled with radon gas in hopes of improving their health.